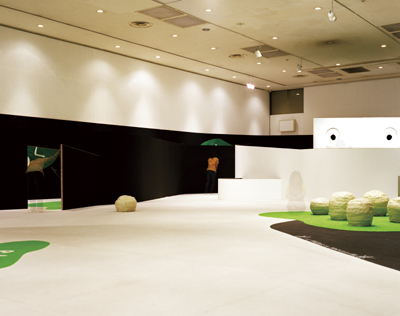 constructor: Izumi Senko-sha blackboard maze, plastic lawn, etc. This exhibition is designed for children and adults to feel and enjoy art more closely and freely, using their bodily senses. 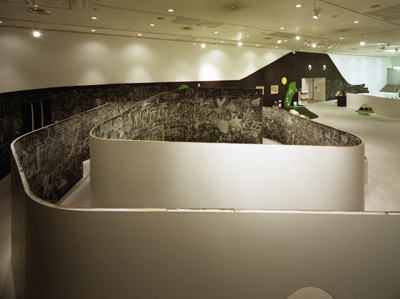 The space consists of a huge maze; a long, coiled blackboard strip called “Mr. Loop”, punctuated with bumps and tunnels. 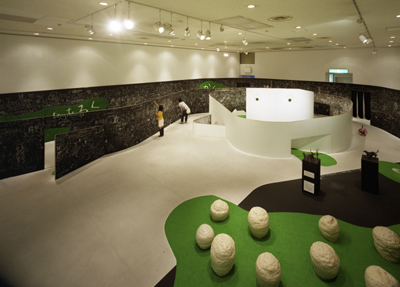 Play, experience, exhibit, draw… these activities are integrated in this unique landscape. Visitors are free to act and play in their own ways. 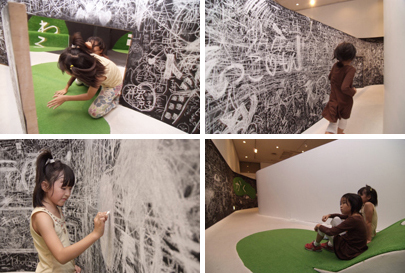 Kids run around, climb over bumps, crawl into tunnels, draw and scribble on “Mr. Loop”. Adults find artworks and start making huge clay models. It is so much fun that everyone wants to play and stay longer. The blackboard strip will soon become white, full of drawings, scribbles and graffiti that visitors made. In this unique art wonderland they are all free to make the most of their creative energy.